How many wrongs before it sounds just right? Tune in tonight at 10PM (GMT+02) for a very special 100th edition of the Wrong Rock Show, when Greg ‘the Hammer’ and Botha revisit some favourite artists and tracks played in two years of shows. You can look forward to The Psychedelic Furs, The Gun Club, Boris, Jim Neversink, PJ Harvey, KOOS, The Clash, Kokeshi Doll, Swans, Joy Division and many more. We think you’ll like it, and we’ve been wrong before. The Wrong Rock Show on 89.5Fm is causing a bit of a buzz in Finland judging by the media reports we have been receiving – see Västra Nyland pic or Åbo Underrättelser. 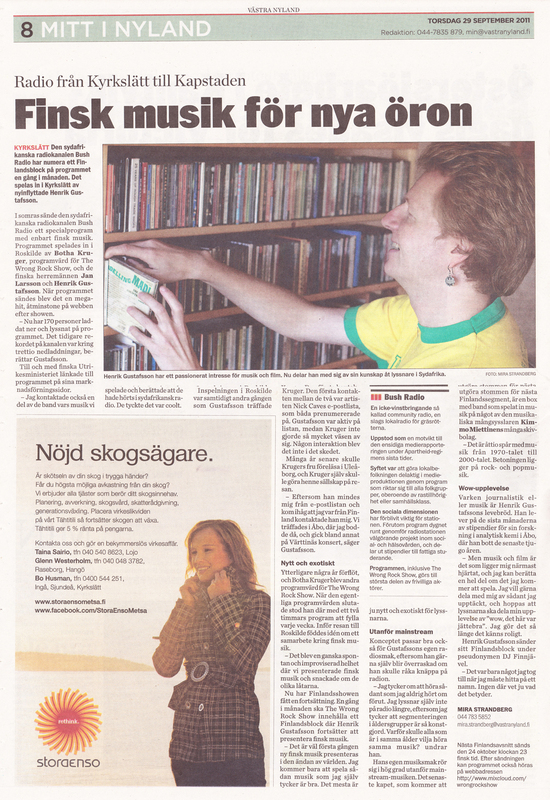 The articles are from Swedish-language papers but if you would like to find out what the fuss is all about tune into the Wrong Rock Show tonight at 10pm on 89.5FM or online, when we air the second edition of “From Kyrkslätt with Love” a segment compiled by Henrik Gustafsson. 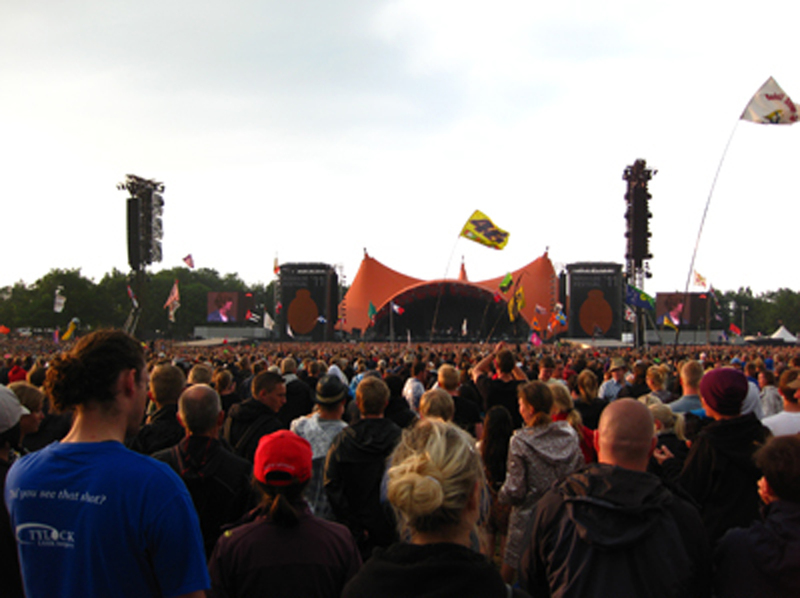 Roskilde Festival in Denmark, first staged in 1971, is the largest North European culture and music festival and attracts about 75,000 festival goers every year (excluding day-visitors). It is run by a non-profit association, assisted by 25,000 volunteers and every year it donates all profits to humanitarian and cultural purposes. 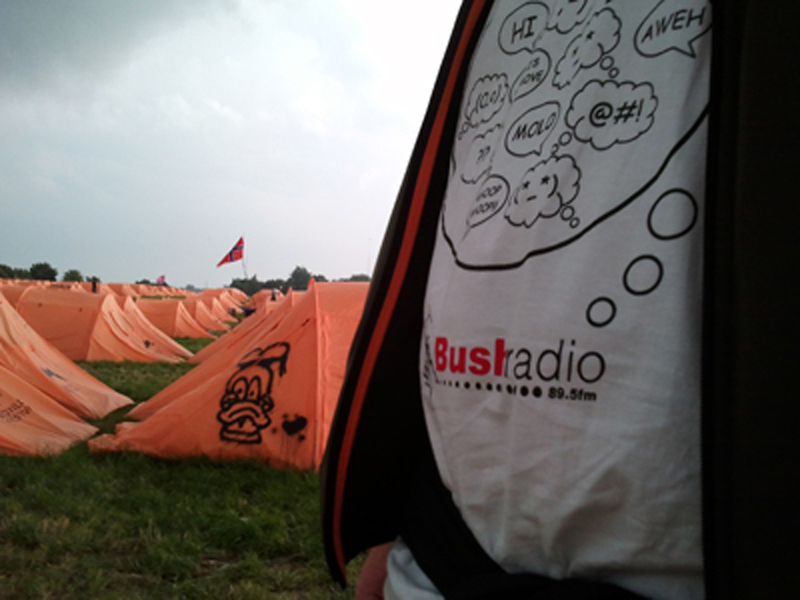 This year, a Bush Radio t-shirt was also spotted walking around the festival site between 30 June and 3 July, when Botha of the Wrong Rock Show attended the festival for a second time. While the headline acts are always the biggest attraction for the majority of music fans attending, the value of the four-day festival is the exposure fans get to different genres and artists. South Africa was represented this year by Shangaan Electro, who had a stunned crowd on their feet before they knew it, and as the beats got faster and faster no-one could even think of stopping for air. Bands in the 2011 line-up that have been played on the Wrong Rock Show included PJ Harvey, Swans, The Strokes, Battles, Kings Of Leon, The Raveonettes, Congotronics vs. Rockers, TV On The Radio, Zun Zun Egui, The Walkmen, Iron Maiden, Lykke Li, Weekend, Anna Calvi, Kurt Vile & The Violaters, Spids Nøgenhat, Screaming Females and The Ex. While at the festival, Botha also recorded a special Finnish Wrong Rock Show with Henrik Gustafsson and Jan Larsson, two music gurus who respectively attended their 14th and 22nd Roskilde Festivals! This special episode will be broadcast tonight (11 July 2011) between 10PM and midnight, and will feature two hours of rock music from Finland not often heard outside Northern Europe. For more information, visit the show’s Facebook page.